The U.S. Census Bureau Survey of Business Owners (SBO) showed impressive expansion for women-owned businesses. The survey’s latest data, released in August, showed nearly 10 million women-owned firms in the United States. This represents a 27% improvement from the survey’s last results in 2007. In the long term, the number of women-owned companies has increased over 50% since the survey showed 6.5 million firms in 2002. This growth in women-owned firms is an encouraging economic indicator. Just as important, this progress occurred during the largest recession since the Great Depression. It stands as a testament to the resilience and entrepreneurial spirit of our country’s female business owners. The SBO is an important tool for assessing the state and growth of businesses, particularly women-owned. 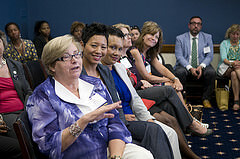 The Census Bureau describes this survey as providing “the only source of detailed and comprehensive data on the status, nature, and scope of women-, minority-, and veteran-owned businesses.” While only the preliminary findings have been released, it provides an important preview of the more comprehensive data that will be made available later this year. The complete dataset will include more specified demographic breakdowns of firm ownership characteristics, including women-, minority- and veteran-owned businesses as well as revenues, size, industry-classification data, and geographic information. It is imperative to use the most complete, comprehensive, and timely data to structure reasoned, directed policy initiatives and make informed decisions, thus, we are looking forward to having the complete survey data later this year. It will be an invaluable tool for guiding our policy direction moving forward, educating government entities and providing useful comparisons for individual firms. We whole-heartedly expect the full dataset to reveal many more successes. This entry was posted in Women's Issues and tagged businesses, data, entrepreneur, expansion, improvement, minority, ownership, success, survey, Survey of Business Owners, United States, US Census Bureau, veteran, WIPP, women, women-owned firms by wippgovernmentrelations. Bookmark the permalink.